Have you tried the Joyetech Cubis yet? Joyetech recently released the Cubis atomizer. Although there are several atomizers with similar features, Joyetech's outside-the-box design sets the Cubis apart. The Cubis is practically leak-proof. It's top-filling, easy to use, and lets you try sub ohm, above ohm, and temperature control vaping. And, in our opinion, it's the best mouth-to-lung (MTL) atty to hit the market since Aspire's Nautilus Clearomizer. Unique two-piece design and hidden adjustable airflow at the top greatly reduce the possibility of leaking. 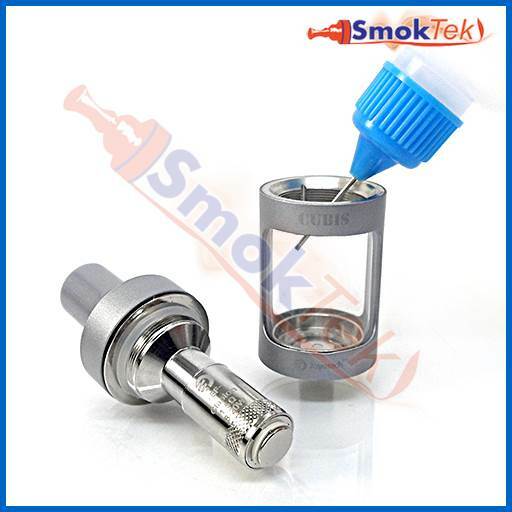 Removing the top cap essentially leaves behind the cup-like tank, which holds your e-liquid. Because the coil head screws onto the chimney - rather than into the base of the tank - there is just no way for any e-juice to escape or leak through the bottom. That is a wonderful thing indeed! The Cubis is a top-filling atomizer. To fill, simply unscrew to remove the top cap and fill with e-liquid up to the Max line. Since the whole top cap is removed when refilling, you can conveniently use any kind of juice bottle - needle-tip, dropper, or even pour straight from the bottle! Even better, you don't have to take off the Cubis from your mod each time you need to top off. 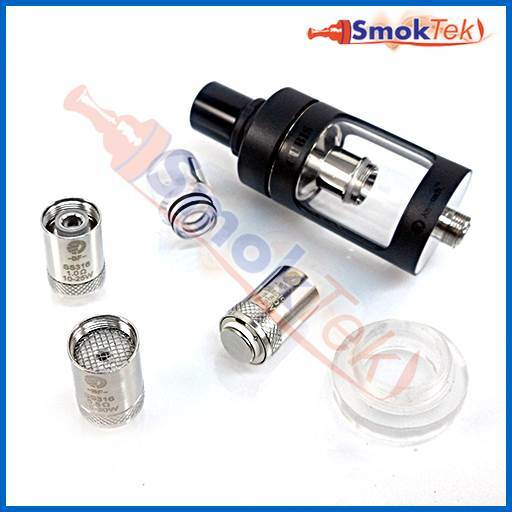 The Cubis comes with 3 coil heads included. Two are made with stainless steel wire (0.5 ohm and 1.0 ohm). These coils are designed for vapers who enjoy direct-lung/sub ohm vaping. When using these coils, open up the airflow wide and enjoy the clouds! What's more, stainless steel wire is compatible with both regular Variable Volt/Watt mods (Eleaf iStick 50W, Innokin Cool Fire IV) and temperature control (TC) mods (Joyetech Cuboid 150W, Eleaf iStick TC100W). When using the stainless steel coils with your TC mod, remember to set your device to TC-SS mode. Also included is one kanthal wire coil (1.5 ohm), intended for Variable Volt/Watt devices only. This coil is terrific for mouth-to-lung vaping, or an inhale that mimics taking a draw on a cigarette. The flavor provided by these coils is excellent - bright and pure. Although the Cubis lets you try sub ohm vaping with the included 0.5 ohm coil, we believe the tank truly shines when used with the 1.5 ohm coil. Everyone at SmokTek who vapes in the MTL style has fallen in love with the Cubis. 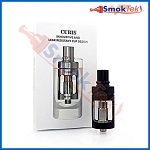 If you are a mouth-to-lung vaper, you have to try the Cubis! It just might be the best MTL atomizer currently on the market. The Joyetech Cubis is available in Black, Silver or Grey - check it out!